» Is Laser Gum Treatment Right for You? Is Laser Gum Treatment Right for You? If you’ve recently found out that you’re one of the 85% of American adults with gum disease, you’re likely weighing your options on what treatment plan you’d like to implement. There are a lot of options out there, but one of the most talked about currently is laser periodontal therapy. Either of these reactions is understandable, but before you decide how to move forward with your periodontal treatment plan, let’s look into gum disease itself and what makes laser treatment a viable or unviable option for different people. Periodontal disease, or gum disease, starts with inflammation in the gums around your teeth. This stage of gum disease is known as gingivitis and can often be treated with an improvement in oral hygiene. If your gums are often swollen or bleeding, your dentist and hygienist has probably already started to keep an eye on it and recommended you are more vigilant about brushing and flossing. If gingivitis persists, it can evolve into periodontitis, where the gums recede from the teeth and leave gaps where bacteria can grow and increase risk of infection. If left unchecked, this can lead to teeth loosening and falling out of their sockets. What are Traditional Gum Disease Treatment Options? Early stages of gum disease are often treated with extensive cleanings to remove plaque and instructions for heightened oral hygiene habits. Daily brushing and flossing, use of an electric toothbrush, and antibacterial mouthwashes are all common recommendations. If gingivitis has progressed to periodontitis, surgery used to be the most effective form of treatment. The most common form of surgery for gum disease is Gingival Flap Surgery. This involves the doctor cutting into the gums to pull them away from the teeth and conducting a deep cleaning to remove all plaque and bacteria. This is a common treatment for people with moderate to severe periodontal disease. Traditional gum surgery involves incisions and sutures, often leaving visible changes to your smile. Now, with laser technology, there is a minimally invasive option that leaves your gum tissue uncut and unscarred. Laser periodontal therapy uses a small laser fiber, only as wide as three humain hairs, to target bacteria and infected tissue, while not affecting healthy tissue. There is no bleeding or stitches, because no incisions are made. 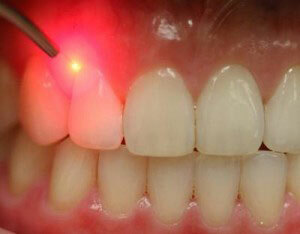 See our handy guide to laser periodontal therapy for more details about the process. If you’re worried about your gum health, talk to us today about the state of your periodontal health and we will outline your options for treatment and recovery. At Winterholler Dentistry, we’re dedicated to providing state of the art solutions to all of your oral health problems!